Today I have teamed up with Nordstrom to share a look featuring the Nic and Zoe Spring 2015 collection. Nic and Zoe has so many pieces that I love. I went with this bright flowy top because I thought the bright color was perfect for Spring and I love the way it fits. I have really been loving wearing all the fun Spring colors. And you can't go wrong with a flowy top and skinny jeans. A great thing about Nic and Zoe is that they offer petite sizes. A lot of times I need my tops in petite and the brand won't make them in petite. So that is really nice for me. This top runs large, I am wearing a extra small petite. Be sure to check out the Nic and Zoe spring collection for some really great quality pieces at great prices. Beautiful outfit, so elegant! I like your tote and sunnies very much. Fantastic color combination! I've been loving the weather in Cali lately and even wearing shorts, so I am 100% ready to embrace these spring colors. You can't go wrong with coral, it looks amazing on everyone! Interview with a Sommelier - Champagne Facts You Need to Know! I love this look, Jade!! Gorgeous pieces! Also love your hair straight like this! I love this color combo and the gold jewelry - so pretty! Beautiful as always! Great post! Give me a silk top and I am happy. This top looks beyond comfortable! Love. I love this color combo! You are so beautiful, Jade! Love your tote and sunnies! Great look, and you look amazing. I can not believe you recently had a baby. Gorgeous!!! Loving your hair lately Jade! This is such a pretty, summery look! I love that bright shirt! I have really similar shirts from Express that I practically live in! This shirt looks really comforatble, the color also brings spring time to mind. Love it. 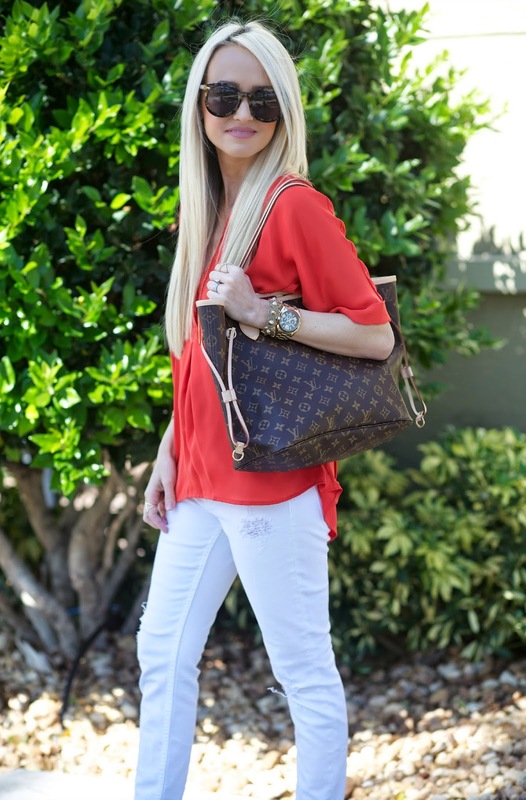 what size LV tote is that you are carrying the Neverful MM or PM?